Southworth Sailor: Done with the WASL! 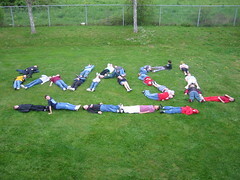 Our fifth graders declared their completion of the WASL testing out on the school lawn. It has been eight days straight of testing for them: three days of science, two of reading and three of math. They are glad to be done. Bjorn and Pat took the canoe over to Blake Island tonight and are spending the night camping. I watched them paddle over this evening against a stiff north breeze. It was an not an easy trip, zigzagging through the wind; but they made it OK and I can see their campfire across the water.